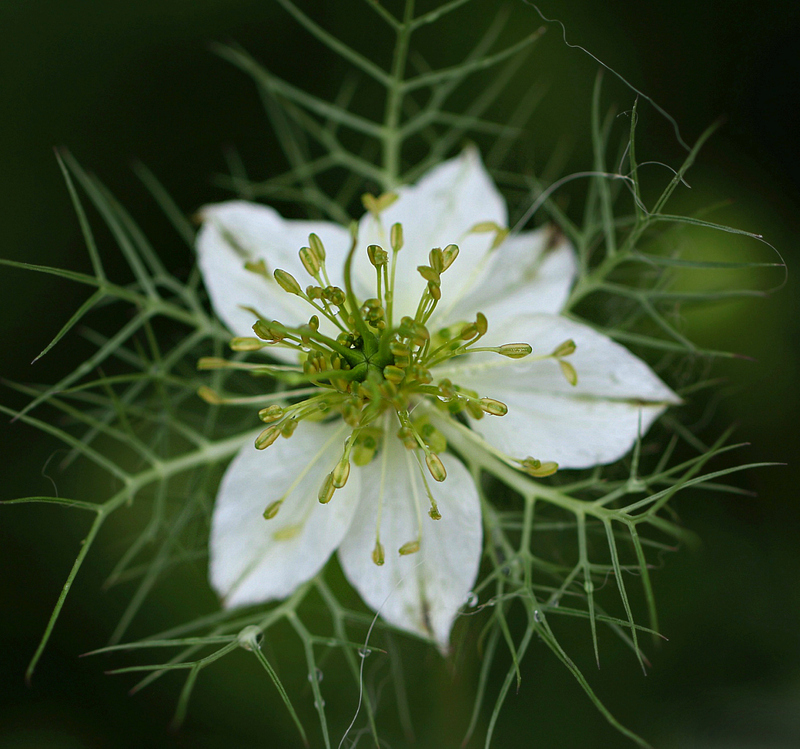 Once in bloom, Nigella’s flower bears less resemblance to a dim sum delicacy than it does to a delicate snowflake. With winter snowflakes swirling around my window and icicles forming on the birdbaths and railings, this late spring “snowflake” becomes an especially pleasing reminder of a more colorful –and warmer — season to come. While it blooms in several colors, including lavender, yellow, blue, and pink, I’m especially fond of the white. The variety in the feathery patterns from flower to flower seemed snowflake-like, too. Each one was just a little different from the others, even though the patterns were basically similar. It was an odd day. We kept swinging from snow to sleet and back again. For a while, I thought the palms might ice up, but at least here they didn’t. Tomorrow, we’ll find out how hardy the pansies and snapdragons truly are. That is so fine and beautiful an image, Linda. The patterns and the white are surely something to behold. It’s a lovely flower, and one I hope to see again.Have you grown it in your garden? I’ve learned that it does well in your area, and I’ve been told that pollinators favor it. I rushed this photo a bit because of the rain, but I think it show the flower well enough. I’m glad you enjoyed it. Its appearance is delicate, but various sites say it suffers no serious pest or disease problems, meaning it’s a tough little beauty as well. It does like cooler weather, and fades away in the heat of summer. No summer here: at least, not now. But by noon tomorrow the ice on the roads will be melting, and after a couple more really cold nights we’ll be back in business. My favorite forecaster says highs for the rest of January should be in the 60s. That’s good enough for me. Here’s an odd tidbit about grade-school me: I wanted to be Heidi. After I read the book, I was ready to move to the top of the mountain and spend my life listening to the wind in the pines. In fact, I demanded to be allowed to drink my milk from a bowl, like Heidi. My parents had a remarkable ability to distinguish between things that mattered and things that didn’t, so for about three months I drank milk from a bowl. Oh, roll on Spring… This is beautiful! Thank you, Val. I’ve read in several places that this has long been considered a “cottage” or “old-fashioned” flower, and it certainly would complement many of the places I’ve seen on your site. Remember that pavilion you showed us? The one we thought might have a conservatory attached? I think this flower would suit that place beautifully — although it would do well in many of those country gardens. We are expecting another heat-wave even though his morning we had the heaters back on. With last week’s rain a number of lilies have sprung up. The garden just never rests, or so it seems. There’s always something coming or going in nature, isn’t there? I’m glad to hear about your rain, and those lilies. We have some lilies and amaryllis that bloom in the fall; I wonder if they’re related to yours? Right now we’re all about the ice and cold temperatures. It’s uncomfortable, but at least the peach growers will have enough chill hours for the fruit this year. I think I’m partly attracted to its common name, Love-in-the-Mist, but its the plant details that make it such a wonderful sight. I like your image of a white one, but I think i’ve only seen it in pinks, blues & lavender shades. I’ve read that blue is most common, and then the pink and white. There are some pretty varieties that have been developed, with double petals and other fancy additions. Still, I like the simpler forms, like this one. As you say, even the simpler blooms are complex, and every stage seems to reveal even more of those details that you like so well. I think I might have an old ‘point & shoot’ camera image of a double variety, which I rescued from my back-up disk. I’ll see if I can find it. It’s really nice! I don’t think I’ve ever seen one before. It’s a pleasure to see it up close. It certainly surprised me when I saw it. Now I’m looking forward to spring, so I can get some good photos of the pink and blue. It shouldn’t be hard, really. I just need to hang around some gardens in addition to the prairies. It’s interesting how the slender branches seem to continue the spreading out of the stamens. 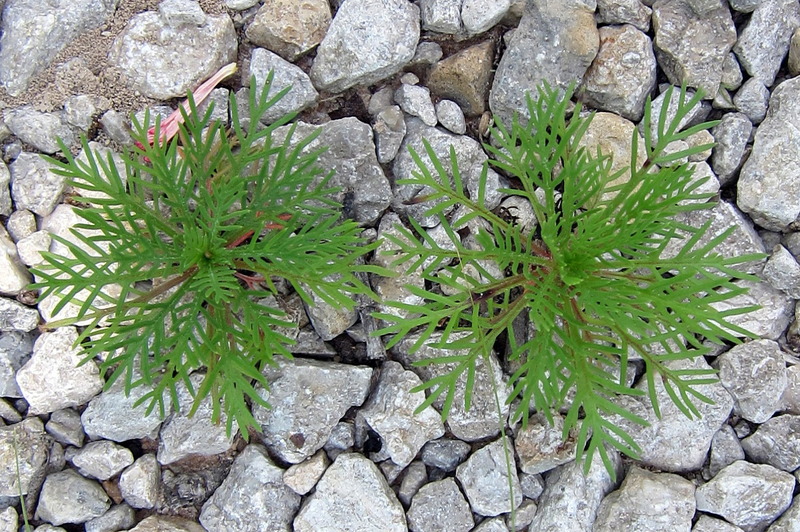 I couldn’t decide what all that featheriness reminded me of, but at last it came to me: standing cypress. Both the rosettes and the mature cypress plants have the same light, airy feel that’s part of the Nigella’s charm. “winter snowflakes swirling around my window “…we sat on the edge of the snow on radar all day… I saw nothing but sleet. And even if I’m run out of town, I’ll be the first to say. I’m kinda enjoying a real winter for a change… Stay warm Linda! The weather people pegged this one, exactly: movement from west to east, rain first, then freezing temperatures, then sleet, ice, and snow. We did bump back and forth between sleet and snow this afternoon, just as you did. By late this afternoon, the icing was pretty pronounced. They’ve closed a portion of the Gulf Freeway south of League City because of ice, and both the 146 and Fred Hartmann bridges are closed. If they keep the Egret Bay bridge closed, too, I’ll not be going to work until after the thaw — there’s no way to get across the Lake. But I’m with you — there’s some enjoyment to be had in all of it, too. Beautiful photo. Love this flower. I heard on the news this evening that is snowing down in or around your area. I am so glad it is not snowing here. It is really cold though. I was out briefly to go to the cat house which is heated. I was glad to stand near the heater before walking up the little hill to my back door. My legs were weak and I was dizzy when I got back inside but I took my meds early and warmed up and then I was ok. I must be careful for sure. Hope you can get some interesting photos during this wild winter. We didn’t get more than a few flurries of snow, but we have ice. The roads are a mess, and it’s going to take until this afternoon for them to clear. By tomorrow we’ll be on our way back to what passes for normal around here. People seem to be taking the advice to stay off the roads, or to be particularly careful, seriously. You be careful, too! Have you grown this flower? I’d never seen it, but I liked it as soon as I saw it. It’s delicate, and intricate, and unusual — all qualities that make a flower interesting. It’s also a sort of snowflake that doesn’t cause any problems. Linda, I had not previously heard of the flower. I have no idea if anyone in my area even grows the plant. I briefly looked it up and I think it can be grown from seeds. I probably will not try growing it since I try to focus only on plants that attract birds and pollinators. I also have a small garden but this year I plan to expand the size so that I can grow more cat nip. My daughter asked me to grown lots more and she will sell some in her practice. My cats love cat nip and especially the fresh green that I cut in the early morning which is when the oils are highest. When I brought my tender plants inside for this freeze, I discovered that my cat enjoys Turks’ cap. I had one plant growing. It’s half as tall now, with some pretty scraggley, tooth-marked leaves. She leaves everything else alone, and focuses on her cat grass, so it was surprising. This is so lovely, Linda. I can imagine it would be so in any color but yes, the white is exquisite. I’ve never seen the seed pods, except in photos, but they’re equally interesting. 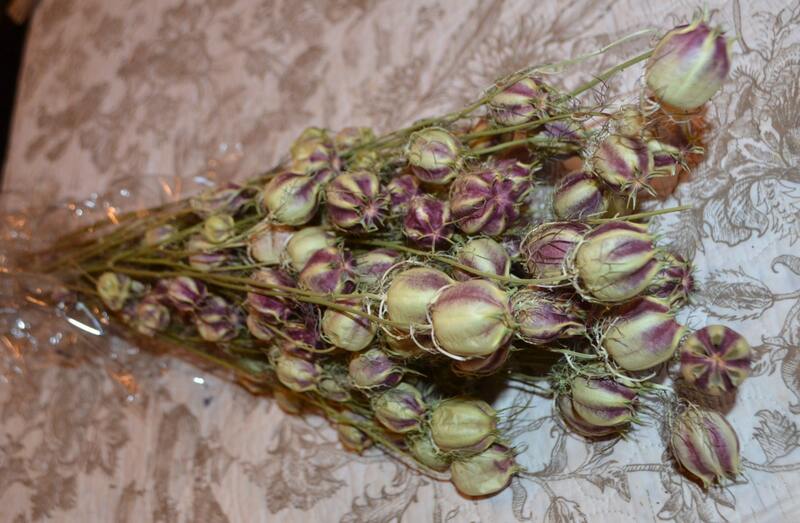 It seems that they dry beautifully, and often are used in wreath making and arrangements. You might inquire the next time you’re at Southern Exposure, and see if they ever use them. I’ve seen the seed pods — I didn’t know what they were but I’m quite familiar with them. I don’t know if SE has used them — not in any projects I’ve done, but I wouldn’t be surprised. Look at that — you’ve seen the plant in a stage I’ve missed so far. Between the two of us, we’ve seen the whole life cycle. Oh my! This is truly lovely. I painted it in my head as I looked at it. The lines are interesting, aren’t they? Was your painting a realistic depiction, or more abstract? I wonder what O’Keeffe would have done with one? A nice, big blue one done in her style — and in a fabulously-sized canvas — would be something to see. That’s a beauty! First time I’ve seen one. I love being able to show you something new, Terry. The USDA map shows it as introduced in Montana. Since it doesn’t like hot weather, that makes sense. They also use a rather different common name: “Devil in the bush.” I can’t figure that one out. Perhaps it becomes more prickly as the seeds form, and it dries. Fascinating flower. Maybe there’s some in my wildflower mix . . . If there were some in your mix, it would be a mistake, since this isn’t a flower that’s native to Texas. In fact, it’s not native to any part of the U.S. Its native territory is southern Europe, north Africa, and southwest Asia. “North Africa” caught my eye, thanks to your references to Casablanca. Your latitude might be just right for it. Stunning photo! The flower isn’t bad, either. It’s been fun to post about a plant that grows in Britain and other countries as well as in our gardens. There are some flowers we share! Oh yes! As long as something doesn’t impair native plants, I’m pro-flower all the time! So pretty, Linda! I’m sorry you have to share in this winter’s misery. It’s been brutal all across the country. They tell us we’ll see a warmup over the weekend; time will tell. I’m beginning to doubt their accuracy, ha! We really were lucky, Debbie. Although we’ve been cold, and had to cope with ice-covered roads, there wasn’t enough ice to cause widespread power outages, and people were smart enough to stay off the roads unless they just couldn’t avoid it. Tomorrow, the schools will open, the roads will be clear, and people will start thinking about the rodeo, and football, and — spring flowers! Very geometric with the leaves and the stamens! The image has a dreamy feel to it. I’m happy you like it, Maria. “Dreamy” is a good word. When I look at it, I think of everything from ferns to gone-to-seed asparagus, and those sorts of things make me dream about spring — even though winter isn’t quite gone. I was also referring to the shallow depth of field, created by the Canon macro lens, this also creates a dreamy effect and I use it often for this reason. The shallow depth of field makes for a nice “bokeh” and this lens is famous for this effect! Very nice!! I wish I’d been able to keep the petals more in focus, too. It was raining at the time, and I had one very large dog trying to get in on the action, so my own focus was a little “off.” Since the gardener is a friend, I’m looking forward to another chance to photograph these during the spring. She has the pink and blue, as well, but my few photos of those just aren’t good enough to publish. The flower is in focus, in the front, where it matters, and I like it as it is! This is what’s nice about this lens. I also have the Canon 60mm macro lens, which is a jewel of a lens. It is smaller though, and that makes one have to move in closer to the subjects. I thought about the 60mm when I bought my macro lens, but decided on the 100mm. It gives me a little more working room outdoors, and has the added advantage of being transferable to a full frame camera. I don’t expect ever to go that route, but if I did, my lenses could go with me. I use my Rebel all the time. I have De Quervain’s Tenosynovitis which is very painful, so carrying a full-frame camera has been nearly impossible for me. The 60mm makes for a smaller kit for me. I have the 100mm too but I ‘ve had to reduce the size of everything. It is often said that Canon camera bodies are behind in ergonomics. This is why people are switching to Sony because the camera bodies are much lighter. However, Canon optics have always been superb and they outcompete Sony’s. Sony lenses are just not as good as Canon’s. The Rebel is the perfect size for me and it has the same sensor as the 80D which is the more “advanced” Canon camera, which is also heavy and bulky, to say the least. I’ve never heard of De Quervain’s Tenosynovitis. Given my work, that’s a good thing, I suppose, since what I just read about it suggests I certainly could be a potential sufferer. I have flareups of arthritis in my thumb joints from time to time, and that’s enough of a problem. I’m sorry you have to contend with a worse condition. It occurs to me that, by the time I might be ready for another camera, I might also be in a position where weight and size are issues for me, too. Right now, the Rebel with even my heaviest lens weighs less than an orbital sander, so it’s easy enough to handle. On the other hand (! ), I do notice that if I go for a time without using the camera regularly, it’s more of a burden. Clearly, my work muscles and my camera muscles aren’t perfectly identical. We’re back to metaphorical snowflakes now here in my part of Texas, and happy for it. I think this flower is one of the prettiest there is. I love our natives, but I’d save space for this one if I had a garden. It shouldn’t be too long before your flowers begin stirring to life — it will be fun to see what treasures you have. It is really pretty, looked at up close like this. After the Dim Sum reference in the last post my son and I looked for a good restaurant here, and it turns out we’d have to go into Chicago. Bummer.